Long ago, there lived a demon called Hiranyaksha. He was Hiranyakashyap's brother and was gifted the boon of immortality by Brahma. No god, demon, beast or man could ever kill him. Hiranyaksha's powers grew by the day. One day, Hiranyaksha snatched the earth and took it with him under the ocean. The gods were alarmed and rushed to Vishnu for help. Vishnu remembered that Brahma had forgotten to grant Hiranyaksha immortality against Varaha, the two-tusked wild boar. 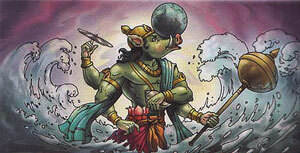 Vishnu changed himself into a Varaha and dived into the ocean. Seeing Hiranyaksha there he challenged him to a fight. Soon, Vishnu beheaded Hiranyaksha and brought back the earth from the depths of the ocean.